It has been a very long time since I posted to this blog. My garden is doing well so far. We have these heat spells that keep hitting us and that makes it difficult to keep the winter garden in a happy mode. Aphids moved in on the broccoli a few weeks back, but I was able to harvest 4 nice heads out of the 6 I planted. Lacinato kale is still flourishing but again, the aphids are trying to live on the underside of the leaves. I am using insecticidal soap to keep them under control. We will see how long I can keep them producing. I planted 6 tomato seedlings a couple of weeks ago. One of each: Black Cherry, Yellow Pear, Cherokee Purple, Jetsetter, Legend, and Early Wonder. Most of these are hybrids. I have had so much trouble with diseases on my heirlooms that I am trying a few of the disease resistant hybrids this year. At least I know the black cherry and yellow pear will produce. We rarely have problems with these guys. We are still using the plot at our community garden and that of course is a banquet for bugs and diseases; moving from one plot to another. We all garden organically and try to keep up with the infestations but it is a challenge. I don't have any photos of the garden right now but I wanted to post and get back to blogging again. In the meantime here is what I have to share. Garden girl, a pillow I made for me! Just a sampling of the embroidery tea towels I have made. 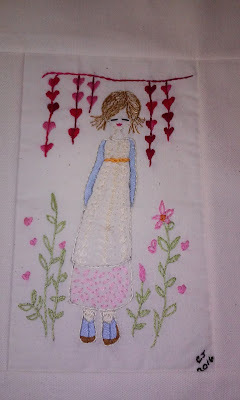 I love to embroider and am really getting back into doing this each evening. Good to see you came back. Blogging has taken a back seat with me since I do most of my communicating on Facebook these days, but occasionally I think of something I want to keep a record of in my blog. I am experimenting with fermenting food and different methods of preserving food since it looks like I just might start getting some fruit and hopefully veggies from my garden and orchard. 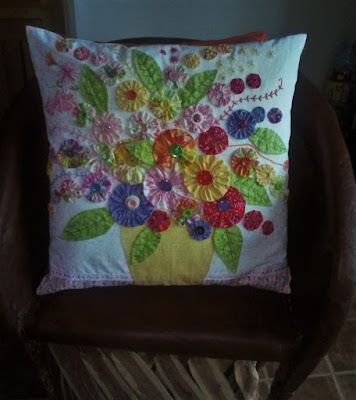 I love pillow you did for your sister! I'm sure she enjoyed it as well. Thank you for stopping by. I must get over to your blog to see what you are up to. I love fermenting foods too. I gaze upon the garden. From its spirit comes my will. From its color comes my being. The waving fronds of heaven clear. "He who shares joy in what he's grown spreads joy abroad and doubles his own." Grow Old Along With Me, The Best Is Yet To Be! I garden organically and grow fruits, vegetables and herbs. We have all sorts of citrus, fig, persimmon and pomegranate trees. Lots of flowers and plants for hummingbirds and butterflies. I consider myself an amateur gourmet cook using my home grown herbs, fruits and vegetables in my cooking adventures. They Love Me, They Love Me, They Love Me! To live content with small means; to seek elegance rather than luxury, and refinement rather than fashion; to be worthy, not respectable; and wealthy, not rich; to study hard, think quietly, talk gently, act frankly...to listen to stars and buds, to babes, and sages, with open heart; await occasions, hurry never...this is my symphony. "I know a bank where the wild thyme blows, where oxlips and the nodding violet grows, quite over-canopied with luscious woodbine, with sweet musk-roses and with eglantine. And there sleeps Titania sometime of the night Lull'd in these flowers with dances and delight."